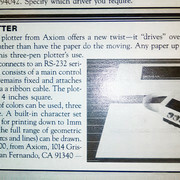 While searching through my old Analog magazines for an ad for the X-10 Home controller interface, to add in a reply in another thread, I stumbled across this in the new product section of issue 28. "Any paper up to 3ft by 3ft is suitable"
That's some ribbon cable to travel and draw say around such a sheet's perimeter. Did anyone ever see one of these babies in action?